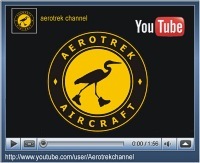 - Aerotrek light sport aircraft - S-LSA - factory built and ready-to-fly! for more information, please contact . . .
Rollison Light Sport Aircraft, Inc.